A Cheesemaker's Journey is intended to be just that - a journey. 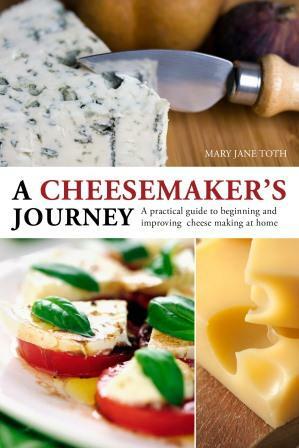 Based on 35 years of experience making cheese, teaching cheesemaking classes across the country and working with other cheesemakers, Mary Jane Toth makes it easy to be successful making cheese in your own home. If you could only have one cheesemaking book, this would be it! * Increase you confidence by watching free online companion videos. Watch Mary Jane make Sour Cream, Feta, Mozzarella, Garlic & Chive, Soft French-Style, Cottage Cheese and Ricotta! All Videos are based on recipes from A Cheesemaker's Journey. This is the perfect choice for anyone interested in making wonderful cheese at home, from the beginner just starting out, to the accomplished cheesemaker looking to add new cheeses to their repertoire. Each recipe will work with either goat or cow's milk and includes instructions on using store bought milk. If you could only have one cheesemaking book, this would be it!